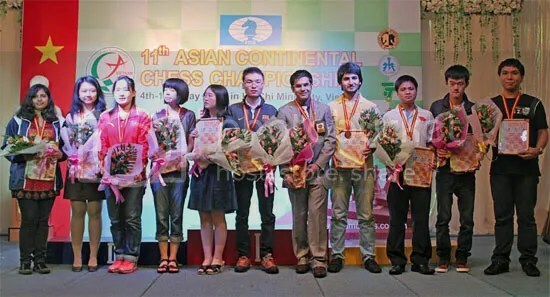 GM Wesley So won the 2012 Asian Continental Chess (ACC) “Blitz” Championship, held on 13 May 2012, the last day of the 11th Asian Continental Chess Championships in Ho Chi Minh, Vietnam. The Philippines’ top chess grandmaster scored 7.5/9 (6-wins & 3-draws), half a point ahead of the 2nd placer Nguyen Van Huy from Vietnam, 3rd placer Ding Liren from China and 4th placer Nguyen Ngoc Truong Son from Vietnam who all scored 7.0/9. The one day Blitz tournament was a 9-round Swiss System participated by 30 GMs out of the 71 players with time control of 3 minutes and 2 seconds increment for each move. Wesley So started on fire winning three rounds in succession against GMs Nguyen Anh Dung (VIE), Dao Thien Hai (VIE) and countryman Mark Paragua. In round-4, he draws with GM Ghaem Maghami Ehsan (IRI) and then again scored another run of 3-wins in rounds 5 to 7 against GM Adhiban B (IND), IM Venkatesh MR (IND) and IM Nguyen Van Huy (VIE) respectively. 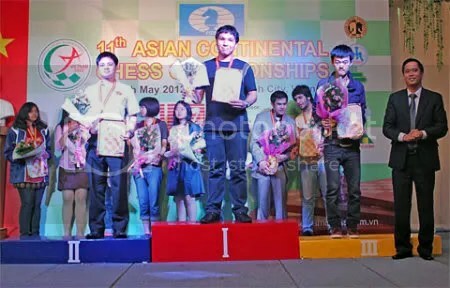 With the Blitz title insight and a comfortable lead, the defending Blitz co-champion of 2011 Asian Individual Open Blitz Chess Championship (Iran), the 2011 World Blitz Qualifier (Moscow) and the 2011 SEA Games Blitz Chess Gold Medalist ( Indonesia) settled for draws in round 8 & 9 against China’s GMs Yu Yanggi & Ding Liren.